My swim at Wildflower was wild – really wild. It was confusing and confounding and a whole lot longer than it should have been and I didn’t understand why until Monday, long after the race was over. I may have mentioned once or twice that I have the world’s worst sense of direction and that I can get lost in a walk-in closet. I actually did get lost in a walk-in closet when I was a kid. It was a very large house and the closet had doors to several rooms but still. 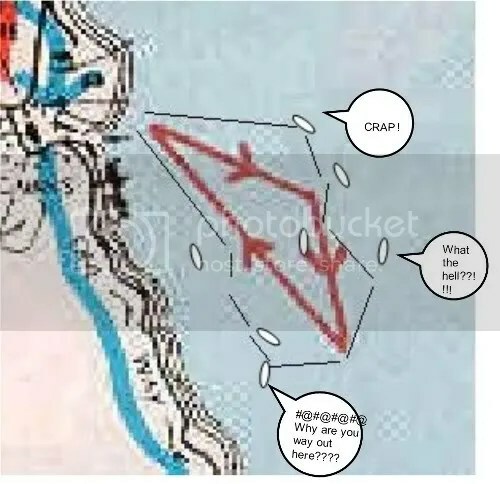 I was totally lost. Another thing I do is glance at directions or just not even bother with that, say to myself, “oh yeah, yeah – I know how to get there” and then head out, without any directions at all. I go entirely the wrong way and spend a lot of time turning around, scratching my head and making my trip take longer than it should. I do this repeatedly because I seem to forget about my little handicap with alarming regularity. Lucky for me, right before I started the swim Bold told me that on the way in all I had to do was site the big balloon arch and head that way. I was good to go. Now, you may recall from my brief report of Sunday night that my goggles fogged up the second I put them on my face and hit the water and that I swam most of the course blind – really blind. I knew there were swimmers around me but I couldn’t see the buoys. Turns out that wasn’t just because of my fogged up goggles. I started the race in the middle of the pack although it had been my intention to be to the right and toward the back. Much of our wave sort of coalesced around me after I picked my spot. The horn went off and I ran down the ramp like very one else and hit the water. I was smack dab in the middle of the washing machine but it was okay – except I couldn’t see. I just kept swimming. I swam and swam and swam and swam and wondered where was the damned buoy and then BONK – I hit a kayak. I looked up, squinted through the fog, located some splash and headed that way. I could sort of see a buoy by now. For those of you who have never done a triathlon we’re not talking about those little things that mark a channel – these are huge, inflatable, bright orange buoys. At this point I am totally disoriented – I have no idea where I am in the water relative to the course and then I hear a guy shouting ‘RIGHT! RIGHT!” so I head right. I must have been near a buoy at that point and I actually think that after I headed right I ended up almost inside the perimeter but there was another boat so I swung wide and just kept swimming. I swam and swam and swam and I still couldn’t see and I guess I drew someone off with me because I was not alone. Then the colors of the caps started changing (again, for you non-triathletes they put each wave in the same colored cap). I was a blue cap and I found myself amid green and yellow and white and I realized that I was passing really slow swimmers from earlier waves and being passed by fast swimmers from a later wave. It didn’t matter, though because I still couldn’t get a bead on where I was. I just kept swimming. And then – rising from the water like the promised land was a buoy – huzzah! I swam to that buoy and got right up close to it, swung around the corner and headed out like a bat out of hell. I was squinting and looking for the balloon arch and I couldn’t see it and I thought ‘WHERE THE HELL ARE THOSE BALLOONS???! !” and then BONK! I hit another boat. At that point I grabbed it and pulled my goggles up and saw that I was way, way off course. I was almost to the other boat launch – so close, in fact that I could smell the gas in the water. “What the hell!!??? Why are you so far out??!!! !” I yelled at the poor kid. He smiled and said, “yeah – there aren’t enough of us out here. Just head over there and join the other swimmers”. Now I was so, so confused. Why were they way over there? And where were the damned balloons?? I zig zagged my way over there and I finally caught them and started heading in the right direction and then I saw the balloons. I was home free! I just kept swimming and headed for shore. Triathlon imitates life, once again. Lesson learned – before I take off I need to make sure I know where I’m going and that I can see. Not as amusing or adventuresome as just swimming along bumping into things until I get where I’m trying to go but way more efficient. Next up – The Wildflower movie and stories of the rest of the experience. This entry was posted in Wildflower. Bookmark the permalink. A tip for next time – smear some dishwashing liquid on your goggles, let it dry then rub it off. Voila! no fog! I’ve heard of the road less travelled but I would never tolerate the swim less travelled like you endured. I’d have drowned before I finished. Wow. I’m laughing WITH you, right?? I shouldn’t be laughing but that is too funny. I love the graphic representation of your swim. imagine if i hadn’t given you the tip on the balloon arch, you may have done another loop with the next WAVE!!! you got it done, and i’m proud. another pro tip — lick your goggles inside!!! I’m sorry, but I am SO laughing at your rendition of your course. Mostly because it would be SO TOTALLY something I would do. I’d have been following you all the way too. It totally coulda been me! I love the graphic – hee hee! I loved your swim map–I feel like that for all my open water swims. 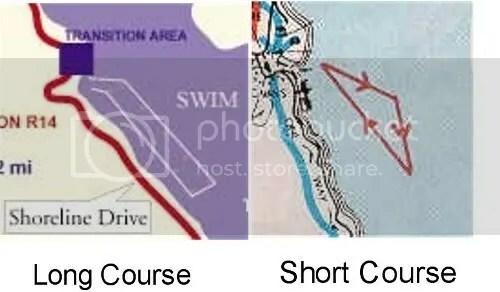 But the course did look like a rectangle to me while swimming it. It’s kind of confusing cause the big pdf map shows it as a rectangle, but then they have the smaller map that shows it as a triangle. I asked all my teammates what they thought it was. I’ll let you know if some of my more experienced triathletes had a different idea. that was some kind of swimming! We are more alike than I usually recognize. Capt. Preook is going to love this story. I can’t stop laughing- which I really need this morning. Maybe directional challenges are genetic? We aren’t just stubborn- maybe we should start a society for the directionally challenged! You did a lot of swimming leading up to this. I am surprised that the fog issues weren’t encountered (and conquered) beforehand. None the less, you *did* do the swim, + some extra, and have a very funny story to show for it. Thanks for sharing. I think I had a rectangle in my head also…but was way off course the other direction! I really didn’t look at any maps…they just confuse me more.. The interesting thing is that I LOVE maps and being navigator in the car on trips. I guess I just let my sixth sense of direction take over and hopefully send me the correct way! Loved your map with comments! I was eating an apple while reading your report and I think I spit it all out onto the screen when I scrolled down and started laughing at your graphics. Too funny! A lot of athletes do this on their first, second, third triathlon. You’ll get it right next time. Congrats on your race and very brave of you to do your first Olympic on such a difficult course. I’ll try to remember to study the course before my first olympic event *and* open water swim next weekend. you are too funny mom . . . it’s no wonder i’m afraid of the water and maps. That sounds exhausting. But you persevered, good for you! Congratulations on finishing Wildflower.